Don’t leave a bowl of candy on the doorstep this Halloween! 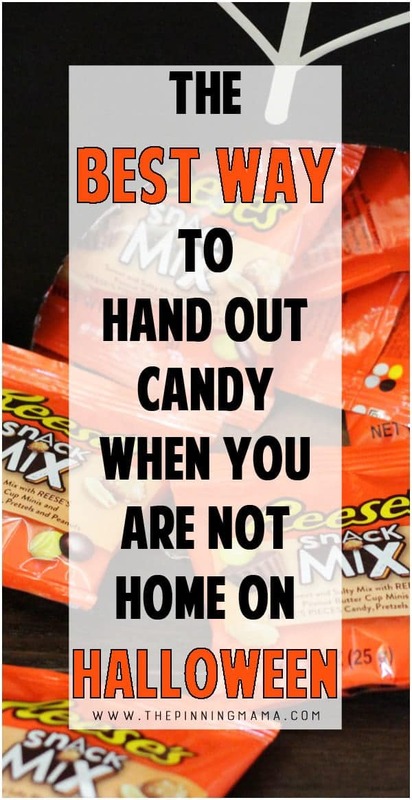 I have partnered with Hershey’s to bring you this simple trick that is perfect for when you aren’t home on Halloween but want to leave candy out for the trick or treaters. It makes it easy for kids to take just a piece or two of candy and deters them from helping themselves to a little too much. 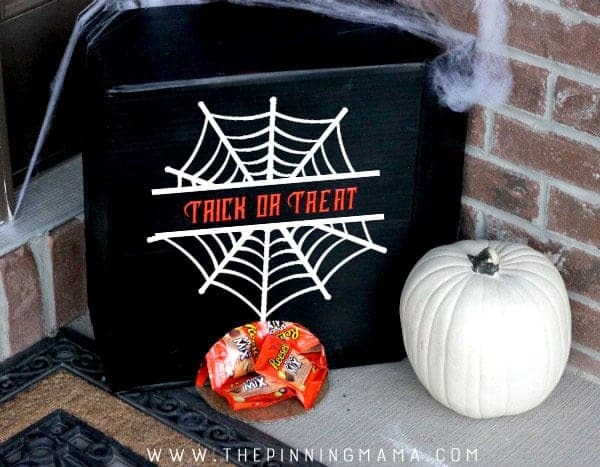 This Halloween Trick or Treat hack is super easy, super cute, and you will never want to just put a bowl of candy out again. 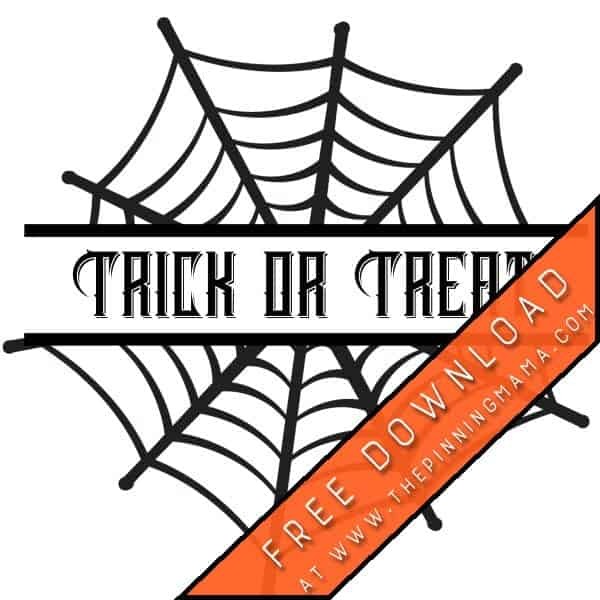 Grab the full tutorial on how to make this easy DIY, and download the free Halloween printable or cut file below! I have partnered with REESE’S Snack Mix Snack Size available exclusively at CVS, to share this awesome Halloween Hack I created, as a post sponsor. Since my kids are little, usually on Halloween both my husband and I want to go out trick or treating with them. This of course leaves no one at the house to hand out candy, so we do what everyone does who isn’t home to hand out candy to the cute little trick or treaters on Halloween. We put out a big bowl of treats on the front door step and leave it up to them to take a couple and move on to the next house. Since we are out with our little ones pretty early for trick or treating I am fully aware that these cute little trick or treaters aren’t always so little, or so cute. We have gone to many-a-home on Halloween where the teenager that hit the house right before us just helped themself to some treats by dumping the whole bowl into their bag. I want to be the cool house with the best candy! I want to fill it up with delicious treats like REESE’S Snack Mix Snack Size. I also want the little ones who love the fun of getting dressed up and think it is magical to get candy at each door they knock on to get a treat at my house instead of coming up to the door to be met by an empty bowl since the teenager that came before them dumped the whole thing in their bag. While you can’t really stop those that aren’t going to play nice, I got to thinking about it and decided I could work just a little bit smarter and would make it just a step or two harder for them, and maybe that would encourage them to think twice and do the right thing. My solution? Meet the DIY Self Feeding Halloween Treat Box. I figured part of the issue was that it is just so easy to pick up that bowl of candy and empty super quick with no one noticing, so if I had a simple solution that made it a bit more cumbersome they might just do the right thing, take a few, and move right on to the next house. Now instead of leaving a big bowl of candy out, I have a big box filled with candy. There is an opening at the bottom where it is super easy for little hands to help themselves to a piece or two of candy, then gravity takes over and naturally moves the next pieces down to the bottom for the next little hands. The opening is just big enough to easily let a few pieces out but not big enough to dump the entire contents into a bag in one fell swoop. After I filled the box with candy, I used packing tape to secure the box closed so it is super easy to refill with a pair of scissors handy but not easy to bust the box open for the average trick or treater only armed with a pillow case or plastic pumpkin. All in all, this treat box is crazy easy to put together, and pretty darn effective. Hopefully now there will be enough candy for all the little cuties dressed up as ninjas, kitty cats, witches, and ghosts will each get their share of treats at our home! Find a cardboard box that will hold about the amount of candy you will be giving out on Halloween. I used a club sized diaper box which worked perfectly for us. Spray paint the box black, or any color to match your Halloween Decor. Find a round object which will give you enough room for the type of candy to be fed out of the box, but not so big it allows it to just fall out. I am giving out the REESES Snack Mix Snack Size and I used a plastic container that measured about 4 inches in diameter. Line half the circle up on the bottom of the box as pictured to trace the mouth for the candy to come out of. Then trace the circle with a pencil to create a half circle on the box. Use a box cutter to cut the round part of the circle to the bottom of the box to create a flap you can open and close. Add decorations as desired. You can print out my design or grab a cut file for your cutting machine with my free download links below. Fill up with candy! Be the coolest house on the block by adding extra special treats like REESE’S Snack Mix Snack Size available exclusively at CVS! Not only are they delicious, but the size of the snack sized package works perfectly for dispensing from the box. Tape the box closed with packing tape or duct tape. 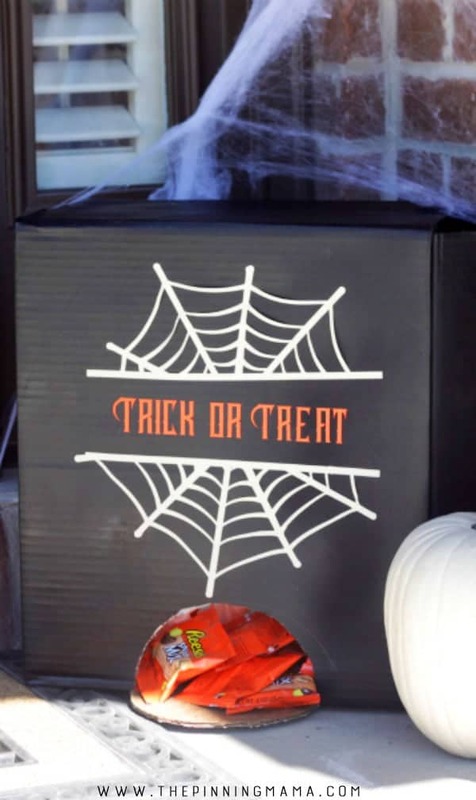 Set it out on the doorstep and let the kids enjoy the treats whether you are home or not! I hope you are able to put this little Halloween hack to use at your house! It sure has worked well for us! If you do this, I would love to hear your thoughts or ideas in the comments. It makes my day to hear from you and I read every single one! That is so cute! Love this idea!! But what happens when some kid decides to steal the whole box? We’ve had this happen with the older children who come through our neighborhood all the while being driven by their parents door to door rather than walking. I’m hot gluing mine to an old table outside. Another idea is putting some weights on the backside and or inside the box or disguising the box somehow so it doesn’t look like it can be taken. Yes I agree! It’s a cute box but seems like a waste of time unless you glue the box down or something ;-). I’m gluing mine down to an old table out back. For more protection from teenagers I am covering mine in duct tape (especially the edges of the opening) so they can’t just rip the box open. I’m also hot gluing the bottom to an old table and might also duct tape it and disguise the box with some black fabric draped over it or something. I am also making the opening smaller. I want it to be semi difficult to pull the candy out so it takes them time to do so. Time is candy lost so hopefully this will prevent teenagers from just stuffing their hands in there. I’m making to opening just big enough for a small hand to reach in. I’ll letchya know how it goes!! !